Willard the worm has his eye on you! 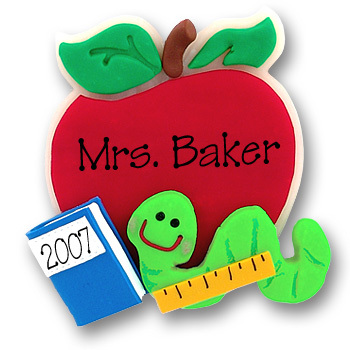 This adorable little bookworm on an apple makes a great gift for your favorite Teacher. Works as either an end of year personalized school gift or a teacher's Christmas gift. It comes complete with a hook and satin ribbon for hanging. This ornament is handmade from polymer clay and designed by Debi Allison.